General Michael Flynn, war hero, patriot, and Trump supporter, faces sentencing next week for alleged lying to the FBI. As more and more think it is Flynn’s support of President Donald Trump that was the genesis of his being a target of the Mueller investigation in the first place, it appears Flynn might find himself a free man in entirety – meaning every bit of Robert Mueller’s accusations against him, up to and including a guilty plea that appears to have been illegally coerced, may be thrown out. …District Court Judge Emmet G. Sullivan on Wednesday ordered Flynn’s lawyers to hand over two documents: a memo that then-FBI Deputy Director Andrew McCabe wrote after speaking with Flynn ahead his Jan. 24, 2017 interview with two FBI agents and the FBI summary of notes taken during that same interview. The original of an FD-302 is to be read and initialed where his/her name is typed by the reporting employee who will thus certify to the accuracy and completeness of the interview. FD-302 is to be dated in upper right corner and is to bear the date of which the typing was completed; the date of dictation is to appear on FD-302 at the lower right corner where other data is set out. If rough draft is made, the date of the rough draft shall be date of dictation. Date of dictation must be within five working days of the action. It is far from clear what actions Judge Sullivan might take. General Flynn is unlikely to get sentenced to any imprisonment, as the sentencing memos from the prosecution and defense both requested no prison. But General Flynn’s good name has been marred with a guilty plea to a felony. If Judge Sullivan was already going to hand out a sentence with no prison time, there may be something else on his mind. If anything close to a full dismissal by Judge Sullivan takes place next week it will be a harsh rebuke against the entirety of the Mueller investigation – and investigation already known for rampant abuses and manipulations of fact. Some have even likened it to a Gestapo-like attack against President Trump, his administration, and any and all who support him. Don’t buy into the Cohen guilty plea and sentencing hype the Establishment Media is now manufacturing. Cohen was primarily charged on misdeeds totally unrelated to his professional relationship with Donald Trump. Today we get a glimpse of just how insidious this entire get-Trump operations has been via words from General Michael Flynn who faced an onslought of intimidation very early on in the Mueller investigation via now disgraced former FBI Deputy Director, Andrew McCabe. In a lengthy court filing Tuesday, attorneys for former National Security Adviser Michael Flynn alleged that then-FBI Deputy Director Andrew McCabe pushed Flynn not to have an attorney present during the questioning that ultimately led to his guilty plea on a single charge of lying to federal authorities. The document outlines, with striking new details, the rapid sequence of events that led to Flynn’s sudden fall from the Trump administration. The filing also seemingly demonstrates that the FBI took a significantly more aggressive tack in handling the Flynn interview than it did during other similar matters, including the agency’s sit-downs with Hillary Clinton and ex-Trump adviser George Papadopoulos. While Flynn is among several Trump associates to have been charged with making false statements as part of the Russia probe, no one interviewed during the FBI’s Clinton email investigation was hit with false statement charges – though investigators believed some witnesses were untruthful. And there you find the primary operational tactic of the Mueller investigation. Call in associates of the Trump campaign and/or the Trump administration, keep them removed from legal counsel, pummel them with questions, then later assert that individual was not entirely truthful with the FBI – thus allowing for formal charges to be filed against them. Use those charges as leverage to get them to admit to Mueller-directed claims against Donald Trump. The FBI never did anything remotely like this to Hillary Clinton or the Obama administration despite multiple actual misdeeds and cover-ups by both. No, this is purely a means of trying to push a duly elected president, a true political outsider, out of office. To his credit, General Flynn appears to have held the line and is now willing to share his experience combatting the serious abuses of federal authorities that attempted to destroy his life and reputation. What a terrible-terrible thing to have these high-ranking Deep State operatives running amok right now working against what has been one of the most successful and pro-American administrations in presidential history. It’s clear what side the Deep State is on and it sure isn’t the side of the American people. Did General Flynn Scare The Hell Out Of Robert Mueller? 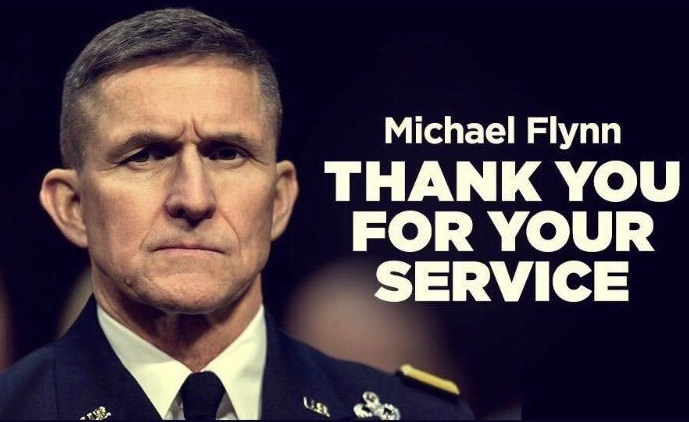 The liberal media spun the NO PRISON TIME recommendation from Special Counsel Robert Mueller regarding former Trump National Security Advisor Michael Flynn as evidence Flynn must be working with Mueller to go after President Trump. Ah, but are things truly what the Establishment Media would have you all believe? …Gen. Flynn may actually have the goods on the fraud behind his own prosecution — namely, proof of exactly how he was set up by Mr. Obama, in particular his own tapes of conversations with Russian Ambassador Sergey Kislyak that would show something different than the transcripts Mr. Mueller used to entrap him on Lying-to-Federal-Prosecutors rap. That theory raises the question: why did he not use it in his own defense. The answer may simply be that he didn’t want to rack up $2.5 million in billable hours for defense attorneys and chose instead to tough it out for nearly two years until he could use the information he has. And that means he must wait until final sentencing when his case is complete. Backstage for the moment, there are two other vectors in motion: whatever Mr. Huber is up to in his mission to examine all those FBI / DOJ ? CIA operations against Mr. Trump, and the parallel inquiry of Mr. Horowitz, the DOJ Inspector general. Mr. Huber will be heard from for the first time this week, and Mr. Horowitz’s report is expected soon, too. Finally, there is the Trump card, so to speak: the president’s power to declassify reams of documents that will shed light in all of the dark chambers of this fairy-tale castle. Wait for it…. After more than a year and millions of investigative dollars spent Robert Mueller has nothing on Donald Trump. So, what’s Mr. Mueller’s solution? He’s about to make it up. The entire premise of the Mueller investigation was to ultimately destroy the Trump presidency. Mr. Mueller is now under immense pressure from the Establishment elites to deliver. Whispers indicate there remains a leaker inside the Trump legal team – one who is said to be working directly with the Mueller investigation as well as Congressional and media enemies of the Trump White House. Mueller is hinting at delivering a subpoena to the President of the United States thinking that scenario will create a lose-lose scenario for Mr. Trump. Refuse the subpoena and the media frenzy will be amplified a thousand-fold. Agree to answer Mueller’s questions and Trump walks into a trap intended to link him to charges of obstruction. Remember former Trump National Security Advisor Michael Flynn? Mueller dropped an interview on him and then charged him with lying. Flynn was bankrupted defending himself against the charge. Guess what? Team Mueller has since backed off of Flynn including another delay in Flynn’s sentencing. Some are speculating the charges against the former military general might actually be dropped as the only real corruption uncovered within the investigation involve Mueller and his associates. The sentencing delay for Flynn is intended to buy Mueller time as he prepares for a final and dramatic onslaught against Donald Trump. Soon after the ABC News report broke that indicated Michael Flynn was going to testify that then-candidate Donald Trump directed him to make contact with the Russians, the stock market plummeted over fears of an impending impeachment. That plunge took money out of the pockets of hard-working Americans. The report was picked up by every other major news agency and went viral. It was a lie and the senior ABC reporter who initiated it has now been suspended for a month without pay for what the network is calling a “serious error” in judgement. It wasn’t candidate Trump who requested then-National Security Adviser Michael Flynn contact Russia, it was President Trump who was doing what presidents do – reaching out to as many world leaders as possible during the whirlwind days of a newly formed administration. It isn’t illegal – it’s required of a new POTUS to do so! There was no proof of collusion. No pre-election coordination with Russia. Nothing. Nada. Zip. But the lie is out there while the correction remains muted by the Establishment Media. Once again it is up to you to share and educate with others. Set the record straight. POTUS Trump is fighting hard. He deserves your help in fighting back with him. The news was getting too good for President Trump of late so the Deep State is now pushing out an alleged Michael Flynn plea deal with the FBI that has Flynn admitting to one count of lying to the FBI in exchange for cooperation in going after, “Trump, family, White House Staff” according to a Drudge headline. The Deep State is fighting back and not just threatening the Trump presidency, but everything Donald Trump has – including his children. It is a headline absent perspective of course. A headline that attempts to paint in very broad strokes the term “collusion” back onto the Trump campaign. What it actually amounts to is a truthful lie – a gross misrepresentation of what really happened. Consider this – Trump won the election. He directs his would-be National Security Adviser to reach out to Russia. So? That’s not illegal. It’s prudent. The Deep State and the media are turning something every incoming administration has done in preparing the normal change in power into something nefarious hoping the American public are dumb enough to swallow the bait whole. Some will. Hold on tight readers. This Trump vs the Deep State ride is about to get real bumpy. The Deep State is getting particularly nasty as it begins to use the President’s own children as sacrificial pawns in its war to destroy everything Trump. No man has risked so much to do right by this country than one Donald J. Trump.